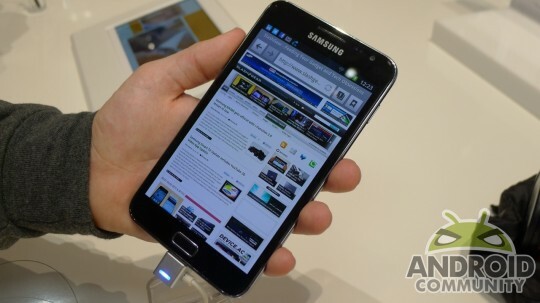 The much-anticipated smartphone/tablet hybrid Samsung Galaxy Note is coming in a lot faster than we expected. In a press release Samsung announced that the Galaxy Note is headed for the white cliffs of Dover on November 17th, just ten weeks after the device’s premiere at IFA in Berlin. The phone will be available at retailers across the UK and Ireland. The Samsung Galaxy Note is a flagship device with a huge 5.3-inch, 1280 x 800 screen using Samsung’s Super AMOLED technology. Naturally the phone has a 1.4GHz dual-core processor and the latest 4G radios. One of the most interesting features is a capacitive stylus with its own on-device storage bay. Coupled with Samsung’s drawing/note apps, this is a throwback to the pen input days before capacitive screens became the norm. Both 16Gb and 32Gb versions will be available with MicroSD card expansion slots. A standard 8-megapixel camera adorns the back with a front-facing cam for video conferencing. Samsung has listed in its product sheet that some models will feature NFC chips, but has not specified which markets will get these versions. US Samsung fans got an exciting indication that the Galaxy Note is headed their way on Friday, when the FCC posted its initial rundown of the phone with AT&T radio bands. Though no official announcement has been made, it’s quite likely that the device is headed to America soon. You’ll be happy to know that the Galaxy Note runs the latest smartphone version of Android (as of now), 2.3 Gingerbread. Previous articleSprint iPhone 5 spotted in Radio Shack inventory list?